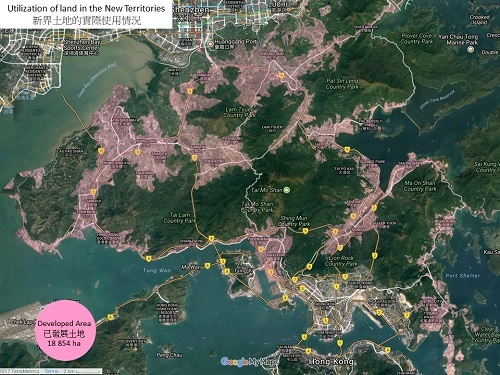 Traveling through the chaos of the New Territories always makes you wonder about our inefficient land uses. So here is a simple review. We made the 18,854ha which appears developed (more concrete than vegetation) pink. 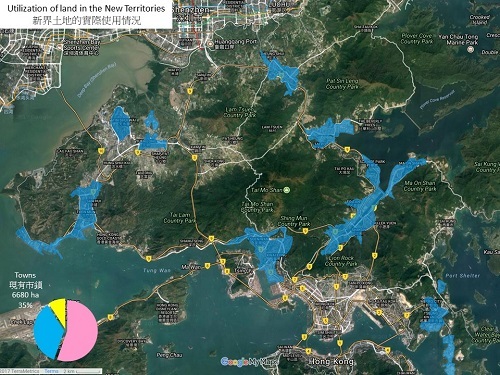 We made the towns like Sha Tin, Yuen Long and others blue. This is about 6,680ha. Next we used yellow to mark the 1,725ha which government is already planning to develop such as Hung Shui Kiu, Kwu Tung and Yuen Long South. Done so leaves us with 10,000ha of land covered with chaotic villages and brownfield areas - land which is often abused for all kinds of trades. This can only lead to one simple conclusion: We do not have a land supply problem, we have a land use problem.